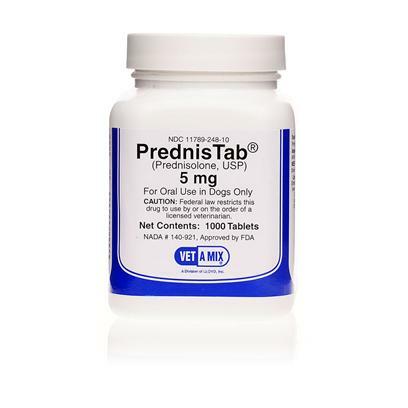 Prednisolone is a prescription medication used to treat allergy and inflammatory conditions as well as a range of auto-immune diseases and disorders in pets. It is known to be effective in the treatment of diseases such as lupus or pemphigus, asthma and inhalant allergies (atopy), certain types of colitis, certain kidney diseases, cancers, autoimmune hemolytic anemias, brain swelling, and Addison's disease. Prednisolone is the Generic Alternative to Orapred. Side effects are generally dependent on dosage, and the most common include increased appetite, thirst, and urination. Less common side effects may include panting, diarrhea, vomiting, restlessness, and behavioral changes. Long-term use may result in the side effects such as hair loss, muscle loss, weakness, the development of diabetes or hyperadrenocorticism, and the development or worsening of hypothyroidism or pancreatitis. Immune system suppression can occur at higher doses, making your pet more susceptible to infection. Contact your veterinarian if your pet has a fever or exhibits tiredness, sneezing, coughing, runny eyes, or painful urination. Stop giving the medication and seek emergency veterinary medical attention if your pet exhibits any of the following serious side effects: an allergic reaction, increased blood pressure, or sudden weight gain. Contact your veterinarian if any side effects seem severe or distressing. Tell your veterinarian about any existing diseases or conditions that your pet has. Do not give PredNISOLone to pets with systemic fungal infections, stomach ulcers, some types of mange, Cushing's disease, high blood pressure, congestive heart failure, or kidney disease. Not for use in pregnant animals, as it may induce labor and cause birth defects. Use caution when giving to young or nursing animals as it may stunt growth. Since Prednisolone affect the outcome of many laboratory tests, make sure your veterinarian knows your pet is taking it before any testing. Talk to your veterinarian before using PredNISOLone with vitamins and supplements or any non-steroidal anti-inflammatory drugs. Consult with your veterinarian if your pet will be using Prednisolone alongside insulin, phenytoin, phenobarbital, modified live vaccines, rifampin, cyclosporine, estrogens, erythromycin, or mitotane, amphotericin B, furosemide, or thiazide. Tell your veterinarian about any other medications that your pet is taking. Consult with a veterinarian before administering Prednisolone to your pet. Typically, dosage varies according to both the weight of the pet and the reason for treatment. For anti-inflammatory purposes, the recommended dosage size is 0.1 - 0.3 mg/lb, to be given twice daily; for treatments that require the suppression of the immune system, dosage size is 1-3 mg/lb, given up to three times a day for the duration of the treatment.